New Yorkers’ trash will become someone’s treasure. Mayor Michael Bloomberg announced this week that New York City plans to move forward with its food recycling plan. Over the next year, New Yorkers will be asked – and eventually required – to separate their food waste from other trash. From an environmental perspective, composting is the right thing to do. San Francisco already composts, but that’s San Francisco. Ditto Seattle. In fact, it’s happening in more than 180 cities across 18 states. As with the bike share, the mayor is playing catch-up, which includes convincing New Yorkers that the extra recycling is worth the hassle, and economically viable. But slogans like “Zero Waste Is Groovy” are less likely to fly here no matter how friendly the city now is. 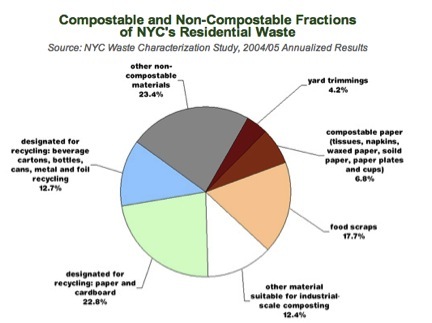 Right now, approximately 29 percent of the waste produced by New York City residents can be composted. Handled correctly, it could potentially be sold instead of left to rot in a landfill, some waste industry experts told the New York Times. If we look at it that way, New Yorkers are basically throwing out money. Still, they’re unlikely to see much profit from it. A potential way for New York to deal with the 100,000 annual tons of food scrap it plans to redirect from landfills (a tenth of the city’s total residential food waste) is already playing out in San Francisco. Recology, the city’s private waste contractor, says it collects over 600 tons of food waste and yard clippings daily. The organic material is processed at a nearby facility and sold directly to farms, vineyards and landscape supply yards. Recology has a monopoly on discarded food in San Francisco, however, which doesn’t sit well with everyone. Last year, a former employee of the company alleged that it had defrauded California taxpayers out of upward of $1.3 million annually. In places where the market is open, a number of entrepreneurial start-ups are finding success by implementing the same process on a smaller scale. To take just one example, Ecoscraps, founded in 2010 by a Brigham Young University dropout, turned a profit in less than a year of collecting commercial food waste from places like grocery stores and reselling it as high-end soil and fertilizer. This March, the company signed its first national distribution deal with Target. Its potting soil will appear in 1,700 stores across the U.S.
There’s potential for profit to be made from the waste generated by private residences, as well, according to Nelson Widell, of the Peninsula Compost Co. Widell told the New York Times that his company sells about 75,000 tons of compost a year for about $20 per ton. While they currently have only one residential supplier –Princeton, N.J. – he hopes that New York’s program will inspire other cities to send waste to organic recycling centers. The chief executive of a leading commercial waste disposal company in New York also told the Times that his company is considering opening a composting center in anticipation of the city’s residential food waste. Demand, however, will need to match supply for this to work. In Washington state, food scrap collection – mandatory in Seattle and encouraged in surrounding areas – has produced more compost than it has use for, said Hallie Harness, the compost outreach coordinator for the Washington State University Snohomish County Extension. Compost, Harness explained to me, is still seen as a luxury item – one that many farmers aren’t able to afford. Right now, she said, the state’s main compost facilities profit by selling on a small scale, for residential use, as well as for road construction projects. As another option for what to do with all of that rotting food, the city expects to be courting proposals for biogas plants within the year. The methane that’s such a problem when food decomposes in landfills can, when that food is separated and processed through anaerobic digestion, be put to use as an alternative energy source. This already happens at most wastewater treatment plants, where the digestion of organic material is turned right back into fuel that keeps the facilities running. Last year, the East Bay Municipal Utility District in Oakland, Calif., announced that it had become the first wastewater treatment plant in the U.S. to become a net producer of renewable energy. According to EBMUD, that’s 55,000 megawatt hours of electricity annually that the district is now able to sell right back to the grid. What that amount of energy translates to on a practical level varies. Wayne Davis, the chairman of the American Biogas Council and vice-president for community and government affairs at Harvest Power, which manages organic waste in the U.S. and Canada, told me that for New York, biogas’s potential will depend on the infrastructure that’s put in place. If all of the power that’s generated from compost is directed toward electricity generation, he said, the city could, over time, build 10 to 20 megawatts worth of capacity. Based on residential consumption data for New York state, each megawatt would provide enough power for roughly 3,300 homes. In New York City, where people live in tiny apartments, that number could be even greater. “Alternatively, you’re probably talking about being able to fuel a couple thousand commercial vehicles,” Davis said. Instead of converting biogas to electricity, another option would be stripping its CO2 to produce biomethane, a natural gas. “What you’re getting is a fuel that is lower cost than petroleum-based products,” he said. As an added bonus, the vehicles burn cleaner. Certain factors, like land cost, could make building biogas facilities a particular challenge for the city, and dealing with the inevitable contaminants like plastics and metals could become costly. But, said Davis, New York’s dense concentration of people and waste could end up making it less expensive to do business. Bloomberg officials anticipate that keeping food scraps out of landfills will save the city $100 million a year. Added to the obvious environmental benefits of getting the stuff out of landfills, it’s not a bad deal.